LaborFest, held each July to honor the aspirations and struggles of working people, is a moveable feast that ranges across the San Francisco area and back and forth in time. San Francisco is union country and it is working people who established LaborFest and have hosted it for the past 14 years. Historically, San Francisco has been the site of many key labor struggles, and according to LaborFest participants, it is the proving ground for struggles to come. Visitors to LaborFest are met by a refreshing atmosphere of solidarity and hospitality that is rare in urban America. LaborFest 2007 began on July 5 and runs through the end of the month. It includes dozens of events from films to forums and dynamic tours (see www.laborfest.net for a full schedule). My wife and I were invited to make a presentation on our labor writings at Modern Times Bookstore in the Mission District on July 13 and experienced five days of the fest — far too short a visit. The five days did, however, provide a rich sampling of LaborFest events. Wednesday. We attended “Labor, Imperialism and Indigenous People,” a forum chaired by Roxanne Dunbar-Ortiz at the New College in the Mission District where speakers addressed the struggles of indigenous people from the international to the local level. The forum underscored the importance of finding ways to link these struggles to the labor movement. Thursday. We were enchanted by the serenity and sanctity of Muir Woods in the Marin Headlands just north of San Francisco, got ensnared in rush hour traffic, and missed the LaborFest film that we wanted to see at the Red Vic Theater in Haight Ashbury. So it goes. Friday. We made our presentation on “The Fight of Our Lives: The War of Attrition against U.S. Labor” at the Modern Times Bookstore in the Mission District. The audience posed lots of questions and comments and the event that was scheduled for an hour went on for more than two. We were all finely, but gently, tossed out onto Valencia Street where we ended up sharing dinner with a motley crew of newfound friends. Saturday. 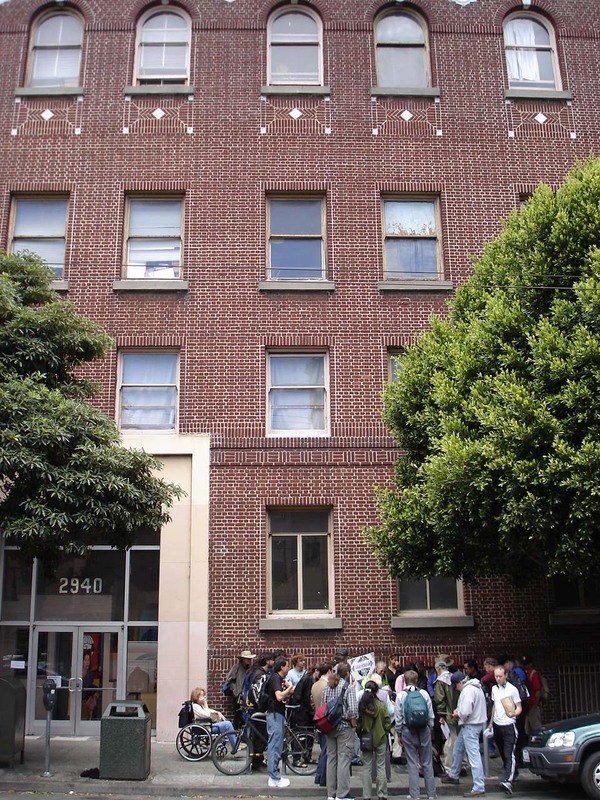 We joined the Redstone Walk, a guided tour of the labor history, art, and politics of the Mission District, which began at the historic Redstone Building. The Redstone Building: The Labor Temple that was the headquarters of the 1934 General Strike that paralyzed San Francisco. The interior of the Redstone is decorated by murals commemorating key labor actions like the strike and picket by the Chinese Garment Workers Union and the formation of the Bindery Women’s Union. The environs of the Mission District are rich with history, including this mural that represents the struggle for recognition by the Mitwoks, one of the many indigenous nations that populated the Bay area long before the arrival of Europeans. Sunday. On Sunday we saw an important documentary about the ongoing privatization of the Chicago public schools and met union activists who are involved in the struggle and made the film (Renaissance 2010: On the Frontlines, available from jpottery2002@yahoo.com) and another film entitled Class Dismissed: How TV Frames the Working Class. Sunday’s activities culminated with a maritime labor history boat tour of San Francisco Bay. 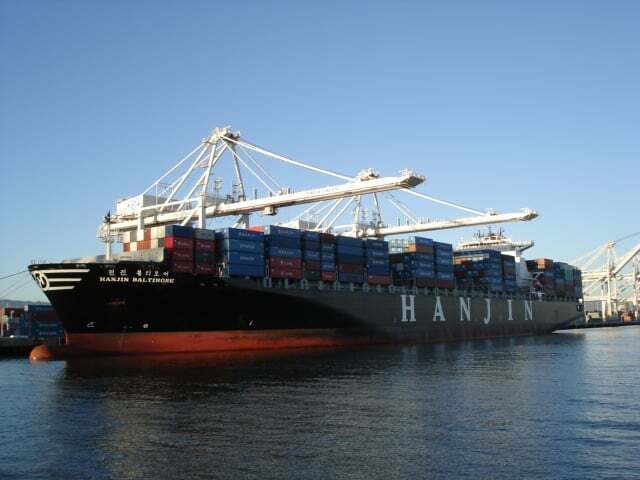 The epitome of offshoring: The Hanjin Baltimore at the Port of Oakland. Giant cranes made in China unloading a Chinese ship laden with goods from the Far East destined for the American market. The LaborFest excursion, which included a tasty and substantial onboard supper, was hosted and narrated by veteran longshoremen and maritime workers, offering a perfect working-class antidote to standard commercial tours. The view of San Francisco from the water at night is unforgettable. Monday. On our last day in San Francisco we returned to the New College for a presentation and discussion of the 1877 Strike and the Chinese Struggle for Justice in America. Tuesday. On the way home we reflected on this year’s experiences at LaborFest and began planning to attend next year. In retrospect, we concluded that 5 days might have been enough for the first time out because the fare is so rich and rewarding. It is easy to understand why LaborFest has spread to Japan, Korea, Bolivia, Germany, Turkey, Argentina, and Brazil. 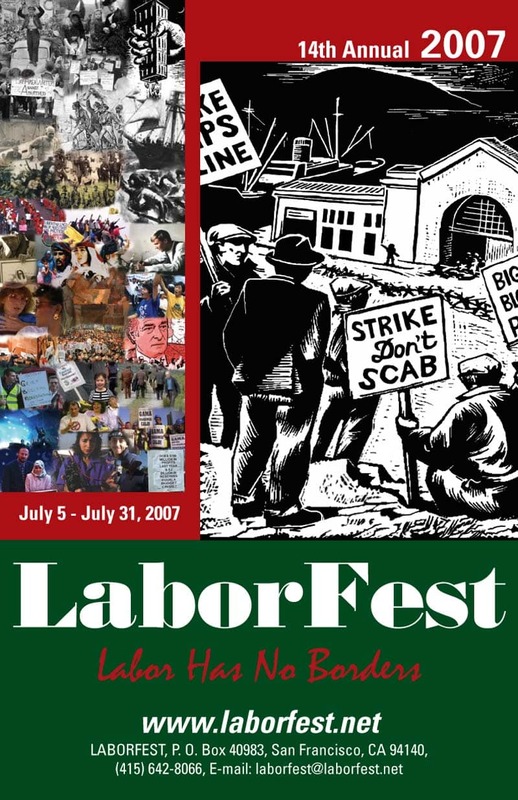 There is still time to attend LaborFest 2007 in San Francisco, and it’s not too early to start planning one for your working community — the folks of the LaborFest Organizing Committee will be glad to help you out. Contact them at laborfest@laborfest.net. Richard D. Vogel is a political reporter who monitors the effects of globalization on working people and their communities. Other works include: “The NAFTA Corridors: Offshoring U.S. Transportation Jobs to Mexico”; “Transient Servitude: The U.S. Guest Worker Program for Exploiting Mexican and Central American Workers”; and “The Fight of Our Lives: The War of Attrition against U.S. Labor.” Contact: irvogel@aim.com.